Not enough lashes? 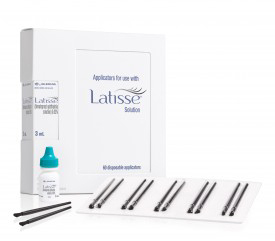 LATISSE ® is the premier FDA-approved prescription treatment for hypotrichosis, a condition characterized by abnormal hair patterns, most predominantly loss or reduction of lashes. LATTISE is used to grow eyelashes, making them longer, thicker and darker. Quick and easy, LATISSE’s convenient once a day solution is a daily treatment you apply yourself each evening to the base of the upper eyelashes. Users see results at eight weeks with full results at 16 weeks. Come in and experience what the buzz is all about! Great eyelashes don’t just happen overnight. It is important to note that LATISSE solution works gradually over the course of 16 weeks. Once you begin, you must apply as directed by your doctor to achieve the best results. Even if you are satisfied with your progress after eight weeks, keep on it. LATISSE’s full results are still to come! As the treatment progresses, at week four your lashes may start to lengthen. Then, gradually at week eight, your lashes will thicken and turn darker. After week 12, you will see enhanced results, and at week 16, you will see the full effect of LATISSE – and so will others. After your 16-week course, talk to your doctor about ongoing treatment. Become a member of the Brilliant Distinctions® Program and receive special offers and exclusive invitations. Add membership to the Brilliant Distinctions® Points Program where you can earn points on select Allergan® products and services. Click the link below to the form online.